U.S. Defense Secretary Chuck Hagel meets with Chinese President Xi Jinping at the Great Hall of the People in Beijing, April 9, 2014. 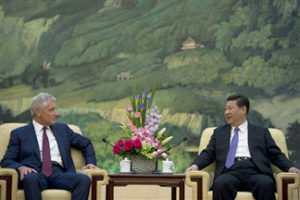 Hagel met with Xi to discuss mutual state and defense issues. BEIJING–Chinese President Xi Jinping has assumed a more direct role over the country’s powerful armed forces as head of its increasingly important joint operations, displaying both his strong personal authority and China’s determination to defend its interests. The move to make Xi commander in chief of the military’s Joint Operations Command Center bolsters his status as China’s most powerful leader in decades and comes at a time when Beijing is becoming increasingly bold in its territorial assertions, despite a growing pushback from Washington and others. Xi already enjoys special influence with the armed forces, largely because his muscular foreign policy is popular among Chinese nationalists and the defense establishment. That’s especially true in the disputed South China Sea, which China claims virtually in its entirety and where it has constructed airfields on former coral reefs and sought to limit the U.S. Navy’s ability to operate in the area. Xi has remained resolute in that approach, although it has been blamed for raising tensions with China’s Southeast Asian neighbors and has prompted the U.S. to devote more resources to Asia and strengthen its cooperation with traditional allies and even former foe Vietnam. Xi visited the Joint Operations Command Center — reportedly located underground in the western outskirts of Beijing – April 20 and said officers need to prepare for conflicts and effectively handle “all sorts of emergencies,” state media reported Thursday. Xi was shown publicly for the first time in camouflage battle dress with the joint center’s insignia, rather than the featureless olive drab attire he usually wears when acting in his capacity as chairman of the Communist Party commission that oversees the 2.3 million-member People’s Liberation Army , the world’s largest standing armed forces. Xi’s choice of apparel “indicates that he not only controls the military, but also does it in an absolute manner, and that in wartime, he is ready to command personally,” said Ni Lexiong, a military affairs expert at Shanghai’s University of Political Science and Law. “The most important message he meant to send to the world is that he will not make a concession on the issue of territory even at the cost of a war,” Ni said. The joint center is under the direct supervision of the Central Military Commission, whose two vice chairmen, Gen. Fan Changlong and Gen. Xu Qiliang, accompanied Xi on his visit. Xi’s new title and appearance in battle dress may also be a deliberate message to China’s chief rivals, including the U.S., Japan, the Philippines and the self-governing island of Taiwan that China has vowed to conquer by force if necessary. “The combat uniform is not only to show he is in charge of the military, but also shows that China is ready for a fight amid a tense external situation. 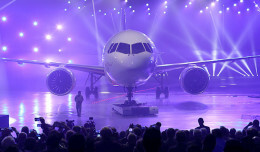 It is a bit like telling China’s opponents that he is ready for combat,” Ni said. Three years since taking on the presidency, Xi is widely seen as having accumulated more power and authority than any Chinese leader since Deng Xiaoping in the late 1980s. A cult of personality has also sprung up around him rivaling that of the founder of the Communist state, Mao Zedong, with Xi’s slogans, sayings and signature political themes widely disseminated in the media. Xi’s cachet with the armed forces is enhanced further by the reputation of his late father, who was a military commander during China’s revolution, as well as by Xi’s own brief service as an aide to a former defense minister. Among his other titles, Xi is also leader of the ruling Communist Party and chairman of a recently created National Security Council, which gives him greater control over the domestic security services. As head of the military, Xi has overseen a reorganization of the PLA’s command structure into five theater commands aimed at better integrating the different services. 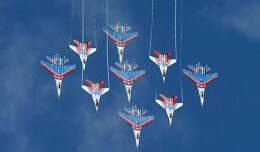 He has ordered a 300,000-person reduction in forces that will see the elimination of many outdated and non-combat units, and shift the emphasis further from ground forces to the navy, air force and missile corps. Xi has highlighted the PLA’s importance with frequent, highly publicized visits to military bases and a massive parade last September in which the army’s latest equipment was wheeled through the center of Beijing while warplanes and helicopters roared overhead. Yet his reputation has also been called into question by anonymous letters, allegedly from Communist Party members, calling for his resignation. Revelations in the international media about vast wealth accumulated by members of his extended family have flown in the face of his relentless campaign against corruption in the party, military and state industries. Xi’s new title is “more political than military” in significance and doesn’t imply he will take charge of the day-to-day running of the PLA, said Andrei Chang, Hong Kong-based editor of the magazine Kanwa Asian Defense and a close observer of Chinese military affairs.